Patch 1.1 is the last patch for the game. FIFA 99 supports multiple rendering methods (Software Rendering, Direct3D and 3dfx). However, due to compatibility issues, it's recommended to use nGlide 3dfx wrapper. Download newest version of nGlide and install it. After you've installed both FIFA99 and nGlide, download a compatibility fix from this site (find FIFA 99 - the fix is in the right column). Go to a folder where you've installed FIFA99. Enter folder thrash in FIFA99 folder. Replace voodoo2a.dll in FIFA99\thrash, with a file downloaded in a fix. Double click on fifa99.reg provided by nGlide to change renderer to 3dfx. Use dgVoodoo instead of nGlide. Performing step 2-7 of nGlide installation is still required. Can be forced using 3dfx wrapper. Mouse is used only for navigating menus. Works well with Xbox 360 Controllers. 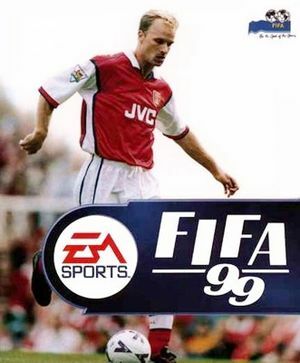 Create a folder named FIFA 99 somewhere on your hard disk (recommended location: C:\games\FIFA 99). From a root folder of FIFA cd copy files EACSND.DLL, FIFA99.EXE and FIFA99.ICO to FIFA 99 folder on your hard drive. Copy folders DATA, SETUP and THRASH to FIFA 99 folder on your hard disk. Create a folder named USER in your FIFA 99 folder. Now you need the registry entries. Copy the following into Notepad and save it as fifa.reg. Edit file paths if necessary. CD Drive should point have a latter of your CD drive. Install Dir should point to a location where FIFA 99 is installed. Add entries to system registry by double clicking on fifa.reg. Now, you should be able to start a game using FIFA99.EXE on your hard disk. If the game doesn't start, double check the paths added to system registry. Launch regedit.exe and go to HKEY_LOCAL_MACHINE\SOFTWARE\Wow6432Node\EA SPORTS\FIFA 99. Check entries CD Drive and Install Dir. As mentioned earlier CD Drive should point to your CD drive (either physical of virtual). If your CD drive has a latter G, the value for CD Drive should be G:\. Install Dir should point to a folder where you've placed files from FIFA 99. E.g. if you've played them in C:\Program Files\FIFA 99, change the value for Install Dir to C:\Program Files\FIFA 99. If problems with graphics occur, try using nGlide wrapper. Start PatchInstall.bat to add it to compatibility database of your system. This page was last edited on 30 August 2018, at 13:32.